McKesson Slipover Adult Bibs help protect patients from fluid penetration. 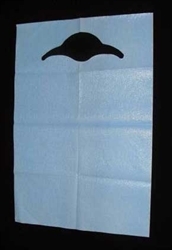 These disposable bibs measure an extra large 20” x 29” to provide maximum patient coverage. McKesson Slipover Bibs are simple and convenient to use for adult or geriatric patients. Simply slip over the head of the patient and remove and discard when done or the bib is soiled. McKesson Slipover Bibs have a tissue layer to offer extra absorption and a poly layer to keep moisture from passing through.